On 15 November 2011, on behalf of the Government of the People's Republic of China, H.E. Zhang Yan, Chinese Ambassador to India, presented a donation of one million US dollars to the proposed Nalanda University at the Indian International Centre. Dr. Gopa Sabharwal, Vice-Chancellor of Nalanda University received the donation. Mr. Wang Xuefeng, Minister of the Chinese Embassy in India, Dr. J.N. Mishira, Joint Secretary (Nalanda) and Mr. Gautam Bambawale, Joint Secretary (East Asia), Ministry of External Affairs, Government of India, and other representatives from the university attended the donation ceremony. In his remarks, Ambassador Zhang Yan said that H.E. Mr. Wen Jiabao, Premier of the State Council of China, made the announcement of the donation during his visit to India in December, 2010, as a friendly gesture from Chinese people to Indian people. It marked a substantial step by the Chinese side to take an active part in this important and meaningful project. Through friendly discussion, it was agreed that the donation would be used for building a Chinese-style library in the future university. Ambassador Zhang hoped the Nalanda University project would further promote cultural and people-to-people exchanges as well as mutual understanding and friendly relations between the two countries and two peoples. 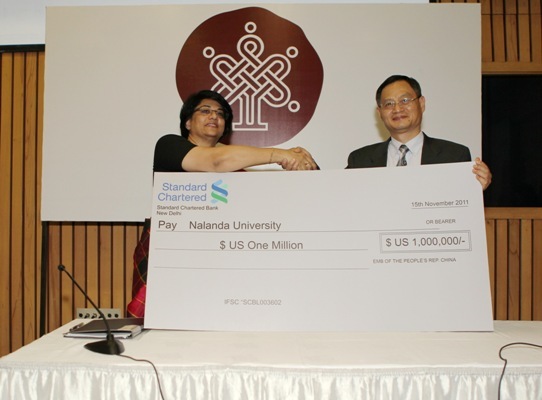 Dr. Gopa Sabharwal expressed her gratitude to the Chinese Government for this very first official donation the Nalanda University had received. She hoped that both sides could further promote exchanges and cooperation. At this ceremony, the new logo of the university was unveiled which also showed the importance the university attached to this event. Nalanda University was named Nalanda Temple in ancient times, when some Chinese monks, one of them the famous Xuan Zang (Hsüan Tsang) from the Chinese Tang Dynasty, once studied and teached Buddhism there. It was destroyed at wartime.